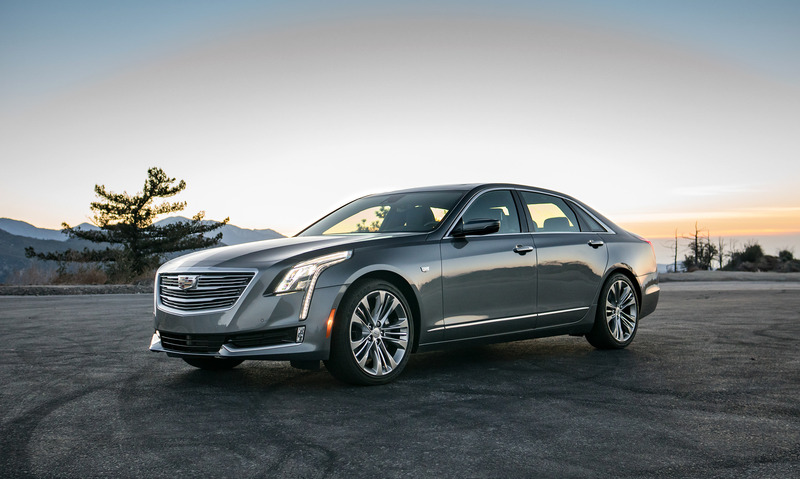 The CT6 is a showcase for the brand’s forward-thinking luxury automotive design. The CT6 stands out from the crowd with its award-winning Super Cruise autonomous driving platform. While it does allow for hands-free travel, Super Cruise actively monitors driver attention. From the great stereo to the comfy seats and the impressive array of technology, it’s hard to imagine wanting much more at this price point. Cruising along the 105 toward Anaheim, I am insulated from all but California’s clear blue skies. One hundred kilometres per hour in the centre lane, and I don’t even have my hands on the wheel. But it’s okay—I’m in the driver’s seat of a 2018 Cadillac CT6, a huge, comfy, quiet, quick, and sometimes self-driving luxury sedan. 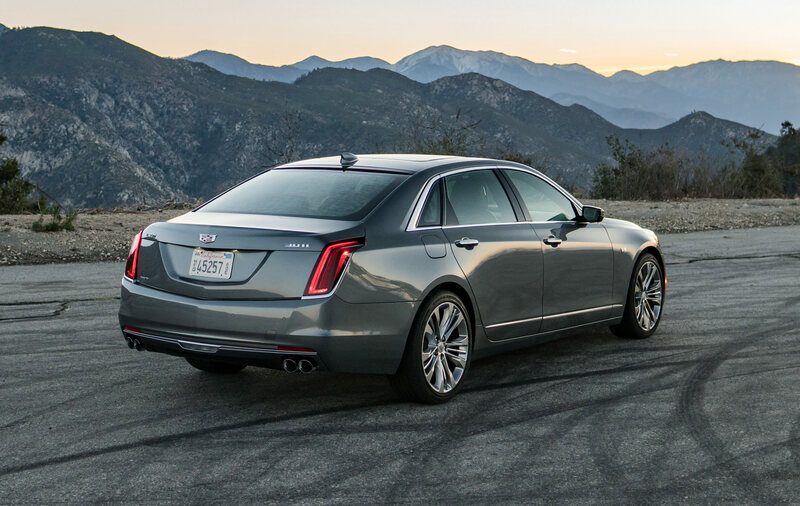 Perched at the top of the Cadillac range, the CT6 Platinum is a modern and appealing spin on the classic Americana of a big Cadillac. Less baroque than many of its forebears, this full-size five-seat sedan is packed with tech and luxury features. 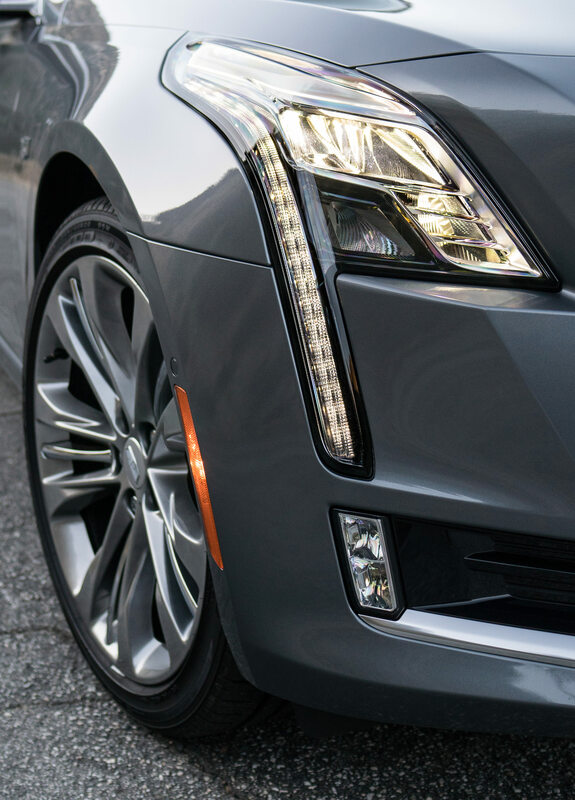 From an exclusive 34-speaker Bose Panaray sound system to wireless phone charging, incredible massaging seats, and Cadillac’s Super Cruise autonomous driving system, the CT6 is a showcase for the brand’s forward-thinking luxury automotive design. There are a few things you can take for granted with this luxurious sedan. The CT6’s ride is excellent: with GM’s Magnetic Ride Control, you get a soft and compliant experience that isn’t the least bit bouncy. The combination of the light but relatively fast steering, the general lack of body roll, and active rear steering makes the CT6 feel much smaller than I expected. At a hair over five metres long, it can easily handle a full complement of adult passengers, or in my case, two large car seats and a week’s worth of luggage for a family getaway to L.A. While it does allow for hands-free travel, Super Cruise actively monitors driver attention, flashing a red light at me if I turn my head to speak with a passenger. Almost monolithic in stone-grey metallic paint, the CT6 is surprisingly subtle for a car of its size. Even with its distinctive vertical LED running lights and 20-inch wheels, it manages to have the road presence of an executive sedan, but with little of the usual pomp and circumstance. While Cadillac recently announced a CT6 V-Sport with a new V8 that makes roughly 550 horsepower, the CT6 Platinum certainly is not lacking when it comes to grunt. With a direct-injected 3-litre twin-turbo V6, the CT6 storms on-ramps with 404 horsepower and 400 lb-ft of torque. While I’m sure the new V-Sport is the one to have if you want outright performance, the Platinum is a well-balanced mix of luxury and power, with all-wheel drive and dynamics that can be tuned for comfort or more spirited driving. As one would expect of a car in this class, tech is abundant. Highlights include the lovely heated and cooled massaging seats, a two-screen rear seat infotainment system, that wondrous Bose sound system, self-parking ability, a host of parking cameras offering a 360-degree view, a digital gauge display, and a matching centre 10.2-inch HD screen for all the MMI (multimedia interface) functions. Thankfully, instead of burying the CT6’s many features in the often complicated and sometimes unintuitive Cadillac User Experience (CUE) interface, a number of the more commonly used settings can be controlled via traditional buttons, including the seat heating/cooling, climate control, and the vehicle dynamics settings. 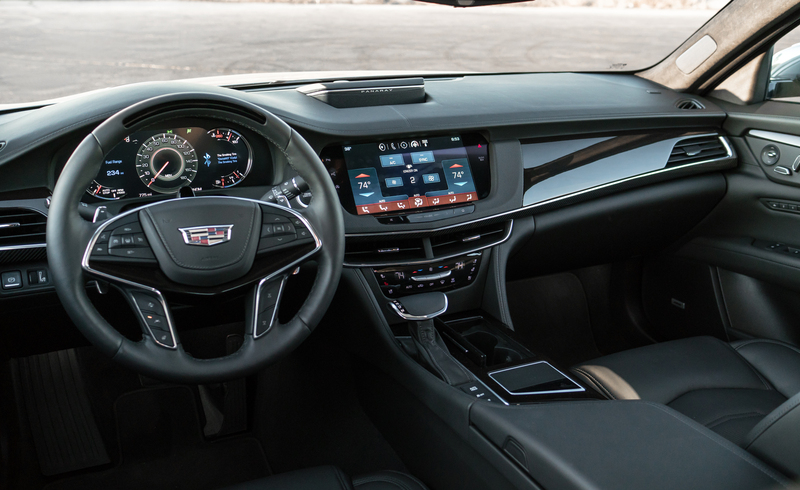 Likewise, the steering wheel is covered in buttons, allowing for the focused and straightforward control of basic media functions, the various settings for the radar cruise control, and manual control of the CT6’s 8-speed automatic transmission. Like other premium models in the Cadillac portfolio, the CT6 has a very useful full-colour heads-up display projected onto the lower portion of the windshield to allow the driver access to speed, navigation, and media information without having to look away from the road. While much of the above technology can be found in many luxury vehicles, the CT6 stands out from the crowd with its award-winning Super Cruise autonomous driving platform. Designed for hands-free driving on highways, Super Cruise is a direct competitor of Tesla’s Autopilot, and blends a dedicated driver attention system with precision LiDAR mapping data to manage the CT6’s position on the road and within the flow of traffic. Once the CT6 is on almost any of L.A.’s highways, a small steering wheel icon appears in the gauge cluster to indicate that Super Cruise is available on this stretch of road. Pressing the corresponding button on the steering wheel enables Super Cruise, and an LED array along the top of the wheel glows green to confirm that the system has been activated. My hands drop away from the wheel as the CT6 sits dead centre in the lane and maintains a comfortable distance from the surrounding vehicles. I am now free to adjust the sound system, change navigation settings, or take a call. While it does allow for hands-free travel, Super Cruise actively monitors driver attention, flashing a red light at me if I turn my head to speak with a passenger or if an object, such as a phone, obscures my forward sightline. If the road curves, the CT6 follows; if traffic slows, the CT6 stays in step, cautiously watching all of the conditions around the vehicle. (It is worth noting that Super Cruise does not steer to avoid safety situations, objects, or road impediments and the driver must always manually steer in these instances.) While the whole thing feels entirely next-level and quite novel, the part I like most about Super Cruise is how well it gets the attention of the driver in any scenario where the system is going to disengage. The lights on the steering wheel, coloured elements on the gauge display, and either a beeping sound or a strong vibration of the driver’s seat will tell me that it’s time to take the wheel. The challenge with these systems isn’t just making a car that can drive itself. It’s making one that can do so in a world full of problematic human factors. The driver needs to be keenly aware of what the system can and can’t do, and Super Cruise communicated this without any drama or stress. I used the system whenever I could, and at times travelled the better part of 30 kilometres without so much as needing to touch the wheel. If you commute on a highway or frequently take long trips, this is good tech, and while you can’t take a nap or check Instagram, Super Cruise does manage to cut back on some of the mental stress of traffic and highway driving. Big, luxurious, comfortable, and forward thinking, the CT6 3.0L V6 Twin Turbo Platinum starts at $100,795 and it feels like a fitting expression of a modern full-size Cadillac. It eats miles, swallows luggage, coddles passengers, and drives itself. It’s an easy-driving and everyday example of an executive sedan, and from the great stereo to the comfy seats and the impressive array of technology, it’s hard to imagine wanting much more at this price point.